Follow this step-by-step tutorial to make light work of painting the finicky surface of a textured wall. While an attractive way to update a knockdown, skip trowel, or orange peel finish, attempting to paint a textured wall can be a trying task. Traditional paint brushes tend to skip the peaks, valleys, and indentations, leaving unsightly bare patches that require multiple passes to cover fully. But all hope is not lost for do-it-yourselfers. If you’re preparing for a paint job, follow along with this guide on how to paint a textured wall. Its meticulous technique using either a roller or wall brush—a paint applicator that’s wider and thicker than a standard brush, with flexible square-ended bristles that hold more paint—will let you paint over any textured wall with stellar results and minimal effort. Choose a primer designed for textured surfaces (typically labeled as “high build” or “problem surface”). Opt for either a white or a tinted primer close to the color of the paint. Either latex or oil-based works here, but keep in mind: Oil-based is more versatile because you can top it with either latex or oil-based paint, whereas oil-based paint won’t adhere as well to latex primer. Choose either a latex or oil-based paint with a low maintenance finish that’s reflective enough to highlight the details of the wall texture—a satin or semi-gloss sheen, rather than a flat matte finish. Move furniture to the center of the room and cover with tarp to protect them when you begin to paint textured walls. Lay additional drop cloths on the floor below the textured walls. Detach mirrors, artwork, and window treatments. Use painter’s tape to cover baseboards, ceiling trim, and any other areas of you don’t want to paint. Turn off light switches or fixtures, shut off the circuit breaker to the room, and then detach electrical outlet and light switch cover plates. Use painter’s tape to mask anything that cannot be removed but should not be painted. While you’ve removed most of your light sources, do set up and turn on a battery-operated work light in the room facing the painting surface so that you can more clearly see the texture of the wall treatment. Fill any holes or divots on the surface using a spackling compound and a putty knife. Let the compound cure according to package instructions. Vacuum the entire textured wall to eliminate any dust on and between the grooves with a brush attachment. In a gallon-sized bucket, dilute one ounce of liquid dish soap in one gallon of warm water. Then wipe down the wall with a clean cloth saturated with the soapy solution to lift grit and grime. Make a second pass with a water-dampened cloth and allow to dry fully. Donning gloves and a respirator, fill a paint tray with primer and load a wall brush or paint roller with a thick nap cover. When painting textured walls—or any walls, really—apply a coat of primer to the wall in “W” shaped strokes for maximum coverage, starting with the top left corner and moving down. Let cure according to package instructions. 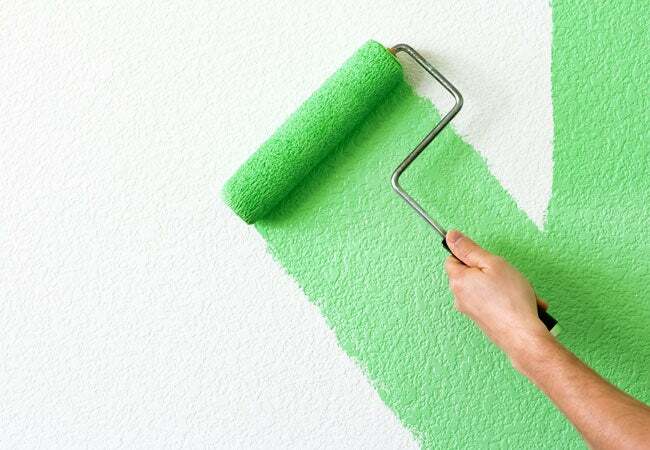 If discoloration or other cosmetic flaws on the wall persist after the first primer coat cures, follow with a second coat and let dry completely. Fill a fresh paint tray with paint, dip a 2″- to 4″-wide angled brush into the tray and use this to “cut in,” painting the edges of the wall to protect abutting surfaces such as ceilings from errant paint strokes. Load a fresh, 1-¼”- to 1-½”-thick-nap roller cover or wall brush from the same tray, and paint textured walls using the same technique you did to prime them: Make a pass over the wall in “W”-shaped strokes, working from the top down until the entire wall is covered. If, while using a roller, you find that the paint isn’t reaching the recesses of a particular region, go over it with a wall brush. When finished, examine the wall to check for missed areas and touch up as necessary with either a chip brush or a smaller roller cover. Let the first coat of paint cure according to the package instructions. 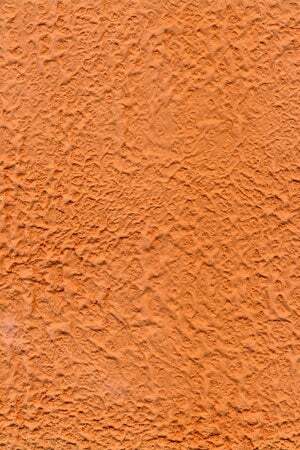 If you desire a deeper hue, repeat Steps 8 and 9 and paint the textured walls with a second coat. Then, let it cure completely before reconnecting light fixtures and otherwise restoring the room.